Donors sending help to institutions and organizations usually worry about the realization of the intent of their donations with many thinking about the diversion of said donations into personal pockets or use by individuals heading such initiative. The Liberian Mandingo Association in New York (LIMANY) and the I HELP Liberia project have been targeting several institutions and organizations for the past years with numerous donations been made in and out of Monrovia. The Booker Washington Institution, J.F.K Medical Center, the University of Liberia, Muslim Congress, Salafiya Islamic School, J.W. Pearson High School in Ganta, The Youth Academy in Ganta, Kpein Public High School in Nimba County, Churches, Mosques and so on, have benefited from the glorious humanitarian assistance of the LIMANY family and the I-HELP Liberia Project headed by Mr. Asumana Jabateh Randolph. Of late, the LIMANY family and the I-HELP Liberia project recently completed a one week science workshop in Liberia with close to seven sessions held at various locations in Liberia. The commencement of the science workshop was held at the Cape Hotel where over forty-four teachers participated with over five teachers winning different science laboratory materials including Lab quest, scientific calculators, Laptop computers and so on. At the commencement of the science session, the science delegation provided breakfast to all participants which according to Liberian standard, would cost ten United States Dollars for each. Similar workshops were held at the Mehdei Memorial School in Jacob Town, B. W. I, in Kakata, Margibi County, Gboven High School in Gbarnga and the Ganta United Methodist School in Ganta Nimba County. After the completion of the official protocol of the workshop, a demand for additional engagement was settle between the science delegation and their host. The science delegation later met with the leadership of the Ministry of Commerce, Lott Carey Mission School outside Monrovia and the Vocational department at the Ministry of Education. At last, the Female Muslim Student Association of Liberia squeezed the final engagement with the science delegation with the final donation been offered to the technical department of the Ministry of Education. All of these workshops were conducted free of charge and materials provided to the science teachers were given without receiving a cent in return. One exciting movement in Ganta occurred during the visit of the Science delegation at the J.W. Pearson Library where some donated books were still at the display in the Library. 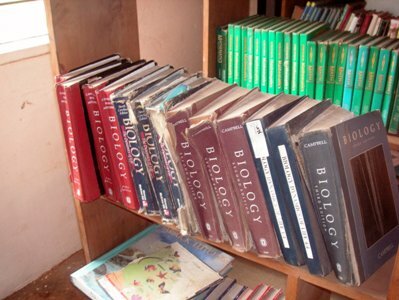 Although the Library is not huge, most of the books placed on the shelf is believed to have been donated by the LIMANY family and the I-HELP Liberia project. The head of the delegation Mr. Asumana Jabateh Randolph felt extremely pride and praised the leadership of the institution for holding up to the tenant of valuable education and promised to do more. He said among all the library visited, Pearson High School in Ganta and the B.W.I in Kakata proved beyond extraordinary. Congratulations on your holy matrimony John !! I hope you find heapinpss, you and Carrie! Thanks for everything that you did in Liberia, make the place your second home. Hoping here Liberian companies would give business as you grow your set up! My best regards and thanks in behalf of all Liberians everywhere who follow your great blog and the wonderful job you did while in our dear Liberia Africa’s first (laughs) take care God bless! We’re hard at work and looking to complete the site as soon as possible — we hope you’ll be back for another visit soon!